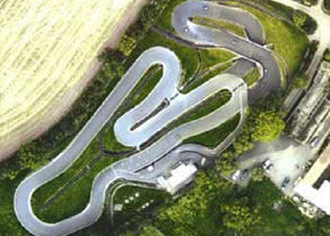 Set among the rolling hills of Herefordshire this outdoor kart circuit has been designed with safety in mind yet provides something of a challenge for newcomers and experienced drivers alike. The track has a fleet of twin or single-engine karts for hire and runs arrive-and-drive, sprints or endurance races.Light refreshments are available at the circuit, with a picnic area where you can relax and watch the racing on the track. While the petrol heads are on the track, park in the secluded car park and take in some of the lovely walks and scenery in the area. With a rally school and many superb pubs and restaurants in the area, the corporate group will find tranquillity and excitement in equal measure. Karting gift vouchers, ideal for birthday or Christmas presents, are also available on request. Head south toward East Street then turn left onto East Street then left again on to St. Ethelbert Street. Bear left on to Cantilupe Street and turn right onto St. Owen Street then turn left onto Bath Street/A438. Continue to follow A438 and at the roundabout take the second exit onto Victoria Street/A49. Turn right on to Eign Street/A438 and continue to follow A438, go through 1 roundabout, turn right on to A480 Go through 1 roundabout take the sharp right on to A4112 then turn left - Destination will be on the right. Junior kart race for six or more kids - 10 - 15 minutes of practice followed by a 15-minute race.